Artist’s conception of the ExoMars Trace Gas Orbiter. After a year of steadily slowing down, the ExoMars spacecraft has finally reached its target orbit around Mars. 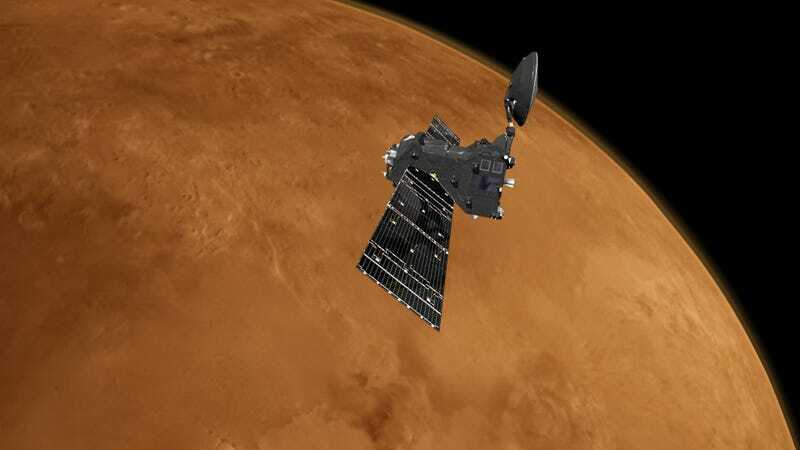 In about two weeks, the European Space Agency and Roscosmos orbiter will begin to scan the Martian atmosphere in search of trace gases, including those potentially linked to life. This week, the spacecraft transitioned from a highly elliptical orbit to a near-circular path that positions it a mere 250 miles (400 km) from the surface of the Red Planet. ExoMars now orbits Mars once every two hours, which means its scientific efforts can proceed in earnest. All that has to happen now are some final calibrations and the installation of new software, after which point the probe will point its various gas-detecting instruments at the planet. Infographic show how methane is created and destroyed on Mars. Mars has an atmosphere, but it’s really thin—about 100 times thinner than Earth’s. It consists of about 95 percent carbon dioxide, about 2.7 percent nitrogen, and 1.6 percent oxygen. 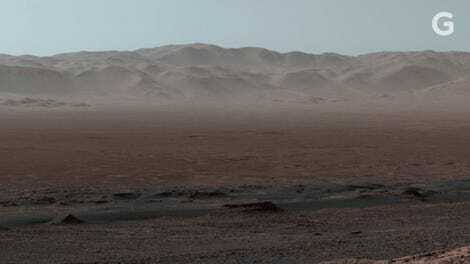 But it also consists of so-called “trace gases,” that is, those gases that account for less than 1 percent of Mars’ total atmospheric volume—stuff like carbon monoxide, water, neon, nitrogen oxide, and others. But the key gas that scientists will be searching for is methane, as it could signal the presence of geological or biological activity. On Earth, methane pours out from natural hydrocarbon gas reservoirs, volcanoes, and hydrothermal vents. But it’s also a byproduct produced by biological organisms. The detection of methane on Mars would definitely raise a few science-minded eyebrows. 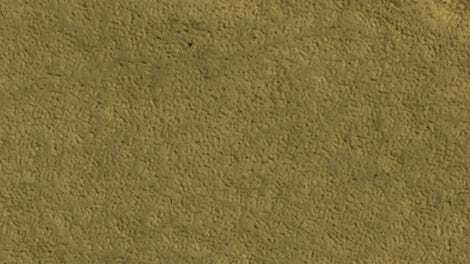 This chemical only lasts for about 400 years or so in the Martian atmosphere, as it gets broken down by the Sun’s ultraviolet light, interactions with other airborne chemicals, and dispersal by high atmospheric winds. So if ExoMars sniffs out some methane, it could mean that Mars is still very geological active. Another possibility, though unlikelier, is it could indicate the planet’s ability to sustain biological life, such as microbial organisms. Before this mission, scans made by ESA’s Mars Express and NASA’s Curiosity rover hinted at the presence of methane, but these results were unconvincing. ExoMars has sensors that are three times more powerful than anything sent to Mars before, and it’ll be capable of detecting gases at extremely low concentrations. It’s various sensors and cameras will peek into the atmosphere, scan the surface, and even detect what lies underneath, such as the sources of leaked gases or even water-ice hidden below the surface. When ExoMars was launched back in 2016, it was accompanied by the Schiaparelli EDM lander. Sadly, the rover crashed during its descent when a miscalculation caused its parachute to deploy too early. That sucked, but the good news is that a Roscosmos-built lander, called the ExoMars 2020 surface platform, will take the place of the doomed rover in March 2021. NASA’s InSight Lander, set to launch from Earth next month, should also arrive on Mars that same year. We mention this because the ExoMars orbiter will be serving double-duty as a communications relay station (which it’s already doing with NASA’s Opportunity and Curiosity rovers). Once these landers arrive, they’ll be able to communicate with mission operators on Earth by pinging the ExoMars orbiter first. Which is all very cool. The science lab that we call Mars is about to get a lot more exciting.